Special Edition of Assassin's Creed: Revelations Sends Ezio After... Vlad the Impaler? A higher-priced version of this fall's Assassin's Creed: Revelations called the Animus Edition, will ship with a short film, an encyclopedia and a host of other extras, including an intriguing extra mission that suggests a crossover with the legend of Dracula. 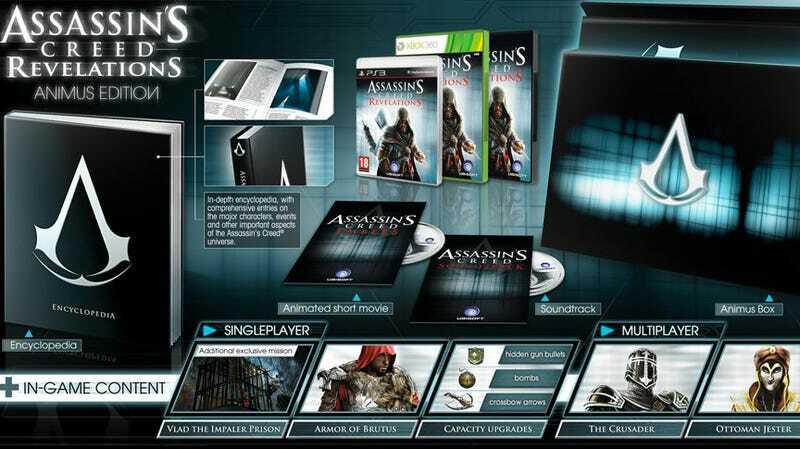 The details for the GameStop-exclusive Animus Edition first popped up online during E3 week. But I missed them then and maybe you did too. Here they are, from the retailer's website. -In-depth encyclopedia, with comprehensive entries on the major characters, events and other important aspects of the Assassin's Creed® universe. -Explore the prison of legendary Vlad the Impaler, the scourge of Constantinople who inspired the myth of Dracula. Seek out the hanging cell of the infamous leader to retrieve his personal blade, a deadly close quarters dagger capable of dispatching any foe. -Capacity upgrades for your hidden gun bullets, bombs & crossbow arrows to give you a decisive advantage in battle. Vlad the Impaler was already referenced in the side-missions in Assassin's Creed Brotherhood (well, his coins were referenced). The Brutus armor was available to those of us who played certain key side missions. The whole thing is going for 100 Euros on the Irish GameStop site and pegged to a November 6 release. It's not listed on the American GameStop site yet, but 100 Euros is about $140. For those who want Revelations but don't want to spring for this bundle, it's safe to assume that all of the in-game content will eventually be able for all gamers to purchase within a few months after release, as was the case with bonus levels for the previous AC games. For more on Assassin's Creed: Revelations read our previews of the game's single-player and multiplayer modes.